It is our goal to continue to dramatically revolutionize excellent deliverables as well as endeavor to assertively create mission-critical paradigms while maintaining the highest standards. To interactively synthesize revolutionary content to stay relevant in tomorrow’s world while maintaining 100% customer satisfaction. Seating Dynamics is a product family produced by American Track Roadsters, Inc. I am Greg Peek, owner of American Track Roadsters, Inc. (ATR), and a thirty plus year veteran of the wheelchair industry. 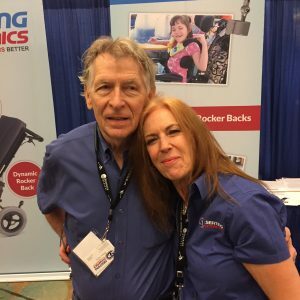 I was first exposed to wheelchairs in 1976 and got serious about them in 1981 when asked to design a new power recliner for the patients at Craig Hospital in Englewood, CO. LaBac Systems was born shortly thereafter. When LaBac was sold in 1997, I was under a seven year non-compete which I honored. My wife and I started Degage in 2003, intending to manufacture manual tilt wheelchairs. Unaware of the current funding pressures on pricing, building a new manual tilt wheelchair wasn’t feasible, but we were exposed to the need for dynamic seating components. Today Seating Dynamics is a more fitting name. I consider myself to be first and foremost a problem solving designer. With a long list of achievements, innovations, inventions and patents in the area of power seating and dynamic components, I can claim some successes in my past endeavors. Today we offer aftermarket products designed specifically to add function and improve durability of wheelchairs. My expansion into dynamic seating components is providing the same level of excitement and satisfaction as the early 1980’s when I revolutionized power recliners. The wheelchair needs of clients with complex seating and mobility needs have provided me with the opportunity to do what I like most and do best – design and build unique high quality solutions to serious needs. The significant needs of this community are not always adequately served by the commodity products which are designed to meet the requirements of CMS and its HCPCS Coding system and DMEPOS Fee Schedule. Our products can turn an average wheelchair into an optimum solution for our most complex clients.